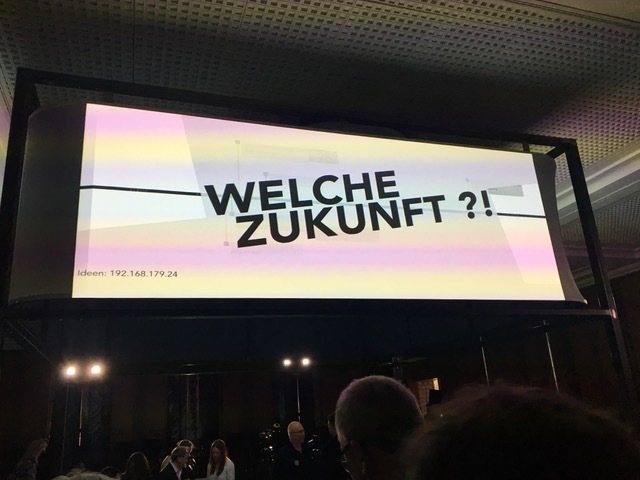 Symposium in Berlin: Which Future!? What if we knew – if we knew for sure that the party is over in 2026, that a bank or an algorithm or a country is pushing the world economy off the wall – what would we do? Here and now, what would we do? WHAT FUTURE ?! is an interdisciplinary, participatory research and theater project that has set itself the task of answering this question: what can we do to prevent a next financial and economic crisis from finally pulling the ground under our feet? Together with international scientists, artists and the audience, the four-part series of events investigates the connection between knowledge, prediction and design and tells the story of the next 10 years: from 2018 to 2028. Somewhere between agora, science-fiction, mathematical model and chance the story of the future. Do not we at least have an idea of ​​her to change her? The goal is to step out of stagnation, leave the permanent present and stimulate debate about our future. Are we driving against the same wall as crash-test dummies of history? The two-year project was initiated by award-winning author, film and theater director Andres Veiel and author Jutta Doberstein. With WHAT FUTURE ?! Together with their team, they are testing new forms of participation and co-creation in order to initiate a public dialogue on future societies between academic-scientific thinking and artistic interpretation. Last weekend, the big symposium of this project took place in the Kronprinzenpalais in Berlin. The symposium is, according to the laboratory of the spring of this year, the second big milestone on the way to the creation of a new play by Andres Veiel, which will premiere on September 28, 2018 in the Deutsches Theater. On Saturday, the numerous experts from science, business, art and the activist scene reconstructed the events of the financial crisis. The spectacular interactive table created a timeline that condensed the incoherent events into a polyphonic and multi-perspective narrative. From the work in the laboratory, two major topics emerged: work and the state. Thomas R. Henschel opened this day together with Andres Veiel and moderated the plenary sessions of the almost 140 participants. The reconstruction of the financial crisis had painted a devastating picture. On the one hand, the crisis would have been avoidable, as Pavlina Tcherneva, a professor of public economics in New York, said. On the other hand, actors were generally not held accountable and ideas and approaches that would better regulate and control the financial industry were thwarted. Only Iceland has sentenced 24 people. All the others who had been responsible in Europe and the US were considered “to big to jail”. Even the already decided separation of investment banking from private banking, whose link is perceived as one of the main reasons for the dramatic turn the crisis took, was lifted by the EU Commission. In one word, business as usual. However, according to the former CEO of Dresdner Bank, Otto Steinmetz, the next crisis will come for sure and we will have no instruments to effectively combat it. But the future is not yet written. We are not determined by the past. And our decisions of today will impact our future. The question is: how do we want to live up to our responsibility today,? Which future do we want? How do we want to live? The labor has created many scenarios for a crash in 2026. Now, how could we avoid such a devastating development? To make new things possible, people need spaces in which they can exchange ideas intensively. The new arises only dialogically. The design of a new discourses demands the creation of spaces to think new, outside practiced discussion rituals. It needs to bring together people and disciplines that usually not talk to each others. Political Scientists with Economist, Philosophers, Historians and Activists. Theater and the art as such are ideal to create those spaces. However the cooperation of people is not self-evident. Structure is a condition for freedom, and so the format of “Which Future! ?” created exactly the spaces necessary for an intense, appreciative exchange between all those involved. So anyone with curiosity, openness and respect for other perspectives could engage in conversation and work together. In this way, something was created that was greater and better than everything one could do alone. For the new to come into the world, it first must be a thought and needs to be discussed as a possibility. In the workshops many different, partly contradictory, complementary and also exclusive models were discussed and developed. Of course nobody was so naive to create quick wins and simple solutions to highly complex problems. It was the creation of a lively discourses of citizens, that helped everybody to learn from different approaches. So reflect what it means to be a human being, what are our under lying values ​​and beliefs, to discuss our desires and goals. The variety of topics ranged from a “land without poverty” to the “unconditional basic income” or a “government job guarantee” on the question of how the utopia of the “United States of Europe” and the “further development of democracy” also and especially the fact that algorithms lead to a new relationship between “power and machines”. Does the state transform itself into a platform where isolated people exchange information and services with each other and otherwise withdraw from everything? Or what about the frightening vision of an elite that retreats on self-created extraterritorial islands, and where only those who own shares can have a say? However one thinks of the “state,” its form and purpose depend primarily on the underlying image of man. So, if we want to think and see ourselves, it gives us the opportunity to be different and new in the world. It therefore does not matter which image of humanity we use. How can the possible become reality? As is so often the case in modern times, we experience the simultaneity of non-simultaneity. While the “light-out factories” are emerging in developed countries, seamstresses in Bangladesh are working under life-threatening conditions on 19th-century sewing machines to produce cheap clothing for consumers. At the same time, we use antagonisms and existing terminology to describe a world that simply can not be grasped by those terms anymore. We are experiencing a break-down of the axioms of meaning and this further enhances the sense of being helpless. Because we can not adequately classify what we perceive and experience, because we do not have words to describe it and to create meaningful relations, we lose our orientation. Without a coherent frame of interpretation, we become unable to act. Since a person alone is not able to grasp the multi-perspectiveness of this world, the truth can only be crated in dialogue. We are therefore dependent on creating such spaces for discourse. It’s not about simple, linear solutions and instructions. But the discourse itself creates dynamic and yes never final, but temporary answers that make us capable of acting again. The challenges we face as humanity as a whole are enormous. But we should keep in mind: The possible does not differ essentially from the reality. It requires a certain mental effort for the possible to become real. There is a possibility that we can master the multiple challenges. Regardless of whether you are a pessimistic utopian or an optimistic dystopian: at any rate, the symposium made it clear that we are not determined by the past. We are free and called to design ourselves as those we want to be and to take responsibility for. That’s what makes us human. Andres Veiel will use the impressions, discussions and results of the lab and the symposium to write a new play which will be premiered at the Deutsches Theater on September 28, 2018. The Humboldt Forum, which still seeks its place and its task, creates with this format an excellent example of how discourses in the 21st century can be initiated and led. Thomas R. Henschel was asked at the end of the Humboldt Forum for his impressions. He thinks it is important that the Humboldt Forum creates spaces in which the dialogue is made possible, how we as human beings want to shape our future in a shared responsibility. Creating such spaces of thought and discourse is anything but a matter of course at a time when the length of a Twitter message and echo bubbles appear to be sufficient and exhaustive information. Supportive structures and formats are needed for people to engage in good dialogue with each other, as appreciative exchange and reflection do not take place on their own. This requires mutual interest, curiosity, longing for something new, the ability to listen and to accept deviant things. Thomas R. Henschel is of the opinion that Andres Veiel and his team use the concept “Which Future! ?” as an example of how such spaces can be created that promote discourse. He very much hopes that Humboldt-Forum, in his search for his task and his place, will seize the opportunity that lies in using such formats for other topics and contents that must be conducted in the international discourse of a developing a global society. Further information can be found on: Which future! ?